^ a b c d e f g h Torres, Guillermo; Kipping, David M.; Fressin, Francois; Caldwell, Douglas A.; Twicken, Joseph D.; Ballard, Sarah; Batalha, Natalie M.; Bryson, Stephen T. et al. (2015年). 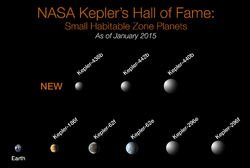 “Validation of Twelve Small Kepler Transiting Planets in the Habitable Zone”. arXiv:1501.01101 [astro-ph.EP]. ^ Perkins, Sid (2015). “Earth-like planet may be not so hospitable after all, thanks to blasts of radiation”. Science. doi:10.1126/science.aad7455. ISSN 0036-8075.